Fast Turn - Low Cost - Satisfaction Guarantee! You will love our cheap booklets, catalogs, brochures, and calendars with vibrant color photos printed on premium text paper delivered to your doorstep in 4 to 7 days from proof approval. Add 80# soft covers and UV coat to give that luxurious high gloss finish. Cheapest book printing prices and high quality guaranteed! #1 Rated for Book Printing Prices! Our online printing company’s nationwide customer base from Los Angeles to NYC has given us a 9.4 TRUSTPILOT RATING and a BBB rating of A+. Read our Rave Reviews. You will love our wholesale printing prices. Thousands of satisfied customers can’t be wrong. Upload your design PDF files (Adobe Suite. : InDesign, Illustrator, Photoshop, Word). Get Started Now! Can I Get High Quality Saddle Stitched Booklets Cheaply? 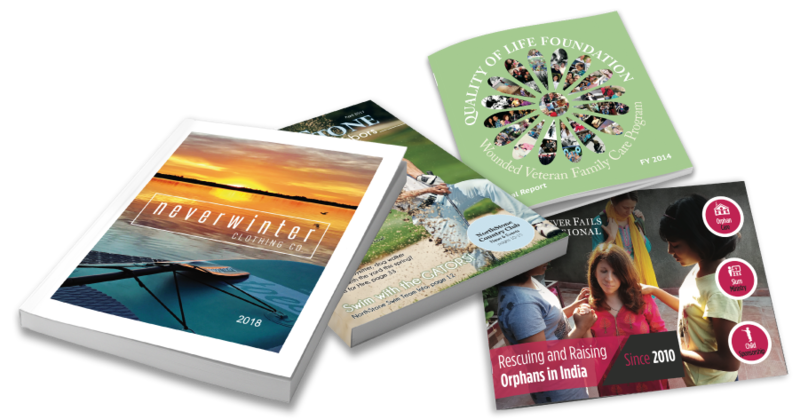 Yes, the lower cost of our "best value” short-run printing allows people purchasing magazines, newsletters, programs, photobooks and look books to be able to afford professional-quality printing, where with traditional printing methods the per-copy cost would be too high to be practical. Why Do You See Our Cheap Catalogs Everywhere? Because they work and are an extremely effective branding tool. Our catalog printing costs match your budget. We can print and mail a short run of booklets for a price similar to an ad spot in a newspaper or on the radio.